Here it is... Knights of the Guild 2nd Anniversary Podcast. 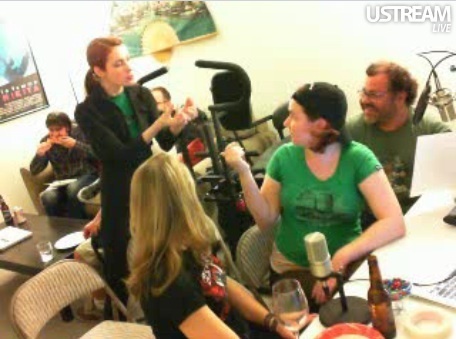 This is Episode #25 pt.1 We recorded this on Saturday February 5th and had a slew of guests (over 25 cast, crew, extras, fans) joined us for this very cool event. We also broadcasted this live on Ustream. If you are interested you can watched the entire 4 hours on our Ustream channel (see the link below). Unfortunately we hit a snag with our recording decided to crash at the very end not saving the project. I did manage to recover the audio but it's in 400 thirty second audio clips all out of order, which makes it impossible to organize it. So I was going to use the audio from our Ustream feed but my friend Chris Pope informed me that he recorded the entire thing and would be happy to email it to me. So that is what you will hear. The audio is from a laptop mic and as you know those kinds of mics pick up everything and everyone and there was a party going on. It's still very enjoyable and we got to talk to alot of the cast and crew. In this part we talk with Sandeep Parikh, Robin Thorsen, Amy Okuda, Jeff Lewis (and Baby Harry), Teal Sherer, Felicia Day, George Ruiz, Kim Evey and Greg Benson. Hope you guys enjoy it.